This website provides downloads, table of contents and a sample chapter for the book entitled ".NET Internationalization" by Guy Smith-Ferrier, published by Addison-Wesley in July 2006. 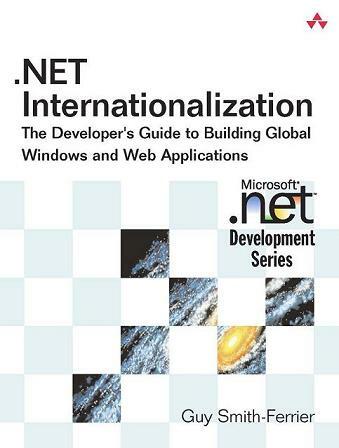 .NET Internationalization covers the subject of internationalization of .NET Framework Windows Forms and ASP.NET applications. It is aimed at developers and team leaders wanting to create applications which run in more than one language and/or region (country). It covers the .NET Framework 1.1 and 2.0 and Visual Studio 2003 and 2005. As businesses become more and more international in nature, it is increasingly important that computer applications be international as well. Version 2.0 of the .NET Framework provides the most comprehensive support of any development platform for internationalizing applications, both desktop and web-based. This book shows developers how to write both desktop and web-based applications which are globalized, or culturally-aware, and that are localizable, or easy to fit different cultures. The author has developed applications in four different development environments, and has been working in .NET since the first beta. While there is some information scattered on the web, he presents valuable information and techniques that are available nowhere else, such as how to automatically translate resources, how to create custom resource managers and custom cultures, new FxCop globalization rules, and proven strategies for including the translator in the internationalization process. Every chapter offers practical solutions to real-world internationalization problems. This book shows developers how they can save their companies millions by incorporating global friendly techniques in their applications from the start. For a complete table of contents see the Sample Chapters.